Royal Music of Purcell & Handel. Alison Balsom, trumpet; Trevor Pinnock, the English Concert. EMI Classics 50999 4 40329 2 0. Alison Balsom is a fine trumpet player, so it’s always a treat to hear a new album from her. The trouble is, the popular trumpet repertoire is relatively small, and there aren’t really a lot of things in Ms. Balsam’s field she hasn’t already recorded. This time, she takes on music of the Baroque period, with pieces by Purcell and Handel. Moreover, Trevor Pinnock and his English Concert accompany her, which makes the disc a double delight since I didn’t even know he and his ensemble were still recording. Because the English Concert are a period-instruments band and because Ms. Balsom is performing Baroque works, she plays a Baroque trumpet for the occasion. This is not the easiest thing in the world since the Baroque trumpet is quite different from a modern trumpet: It has no valves, for one thing, making it more difficult yet more expressive to play. As she explains it, “we hear the breathing of the musician, the beginning of the notes, the complex beauty of the technique--in short, the human being in the sound.” She calls it “an adventure.” For the listener, it is a distinct pleasure. As we might expect from such consummate artists, the solo playing shines, and the accompaniment is lively, enthusiastic, and precise. Things begin with George Frideric Handel’s (1685-1759) “Sento la gioia,” edited and arranged by Trevor Pinnock. It makes a good curtain raiser, especially played with such love and affection as the performers do here. It’s also typical Handel, so you’ll recognize the style of the music and identify the composer instantly. There follow a suite from King Arthur by Englishman Henry Purcell (1659-1695); the Overture to Handel’s Atalanta; Handel’s Ode for the Birthday of Queen Anne; a suite from Purcell’s The Fairy Queen and later a vocal number, “The Plaint,” from The Fairy Queen with soprano Lucy Crowe; Purcell’s Sound the Trumpet, with countertenor Iestyn Davies; and the highlight of the set, the Suite in D from Handel’s Water Piece, drawn in part from his Water Music. It’s all a delight. The program ends with Handel’s Oboe Concerto No. 1 in B flat, transposed into C major, edited, and arranged by Pinnock and Balsom. 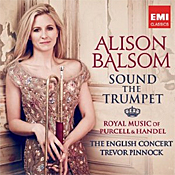 On the trumpet Ms. Balsom provides a gracious, vigorous, lyrical, and enlivening interpretation by turns. EMI recorded the music at St. Jude-on-the-Hill, Hampstead Garden Suburb, and Henry Wood Hall, London, in 2012. The sound is well balanced, the trumpet nicely integrated into the orchestral accompaniment. In fact, it’s some of the best sound EMI has produced in the past decade. The trumpet has a resplendent tone, clearly captured by the audio engineers, along with a pleasingly warm, ambient hall bloom that gives and richness and life to both the soloist and the orchestra. Moreover, the several vocals sound quite natural, and the timpani can be mightily impressive. The room glows with a smooth resonance, a reasonably transparent midrange, strong dynamics, and clean bass and treble extension. It’s an enjoyable experience all the way around. The Emerson String Quartet will perform at Carnegie Hall Tuesday, November 6 with internationally acclaimed pianist Yefim Bronfman in an all-Brahms program. The Quartet will perform select Brahms works for three different instrumentations: string quartet, string sextet and piano quintet. This performance marks the first of two Carnegie Hall appearances the Emerson String Quartet makes in the 2012-2013 season—the second being part of Renée Fleming's Perspectives series in May. Johannes Brahms reportedly destroyed as many as 20 string quartets before the Op. 51 quartets were published in 1873. Even with only three surviving string quartets, Brahms's contribution to chamber music was substantial. The second quartet (in A minor) from Op. 51 appears on the program, along with the composer's String Sextet No. 2, composed in 1864–1865. Longtime Emerson collaborators Paul Neubauer and Colin Carr fill out the instrumentation (viola and cello, respectively) for this work. The final work on the program, Brahms's Piano Quintet, Op. 34, saw a varied instrumentation throughout its development: it began as a string quintet with two cellos in 1862 and was later recast as a two-piano sonata—the piano quintet form was published in 1865. Celebrated pianist Yefim Bronfman joins the Quartet for this final piece. The Emerson String Quartet stands alone in the history of string quartets with an unparalleled list of achievements over three decades: over thirty acclaimed recordings since 1987, nine Grammy® Awards (including two for Best Classical Album, an unprecedented honor for a chamber music group), three Gramophone Awards, the coveted Avery Fisher Prize and cycles of the complete Beethoven, Bartók, Mendelssohn and Shostakovich string quartets in the world’s musical capitals. In March 2011, Sony Classical announced an exclusive agreement with the Emerson String Quartet. The Quartet's debut album for the label was released in October 2011 to coincide with a series of concerts at Wigmore Hall in London and Alice Tully Hall in New York City. In June 2012, the Emerson embarked on its first tour of China which included performances in Shenzhen, Tianjin and Beijing. In 2012-2013, its 36th season as an ensemble, the Emerson performs extensively throughout North America and Europe with appearances in such prestigious venues as Carnegie Hall's Isaac Stern Auditorium and Paris's Musée du Louvre. Formed in 1976 and based in New York City, the Emerson String Quartet took its name from the American poet and philosopher Ralph Waldo Emerson. The Emerson continues its residency at the Smithsonian Institution in Washington, D.C. and is Quartet-in-Residence at Stony Brook University. The ensemble recently announced what will be its first member change in 34 years, when cellist Paul Watkins replaces David Finckel at the end of the 2012-2013 concert season. The Music Institute of Chicago welcomes families for a musical open house followed by a concert of dueling Nutcracker performances Saturday, December 8, 9 a.m. at Nichols Concert Hall, 1490 Chicago Ave., Evanston. Families begin this morning of music with an open house featuring Musikgarten early childhood demos and an Instrument Petting Zoo, where kids can try out playing a variety of instruments. At 10 a.m., a performance of “The Nutcracker SWEET” pits the classical (Tchaikovsky) and jazz (Duke Ellington/Billy Strayhorn) versions of the holiday favorite, performed by Music Institute Ensembles-in-Residence Axiom Brass and Quintet Attacca and choreographed by Ronn Stewart, artistic director of Foster Dance Studios. The Ellington/Strayhorn transcription is by James Stephenson. Other highlights of the Music Institute’s 10th anniversary season at Nichols include the internationally acclaimed Pacifica Quartet in February and pianist Sergei Babayan in April. 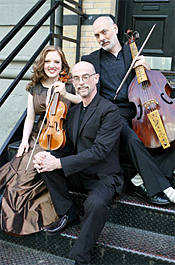 Noteworthy annual events include Family Concerts in December and March; the Martin Luther King, Jr. concert with the Brotherhood Chorale in January; the Four Score Festival of contemporary music in March; and the third annual Emilio del Rosario Distinguished Alumni Concert, this year featuring violinist Rachel Barton Pine and pianist Matthew Hagle in May. The Music Institute of Chicago’s family open house and “Nutcracker SWEET” concert takes place Saturday, December 8 at 9 a.m. at Nichols Concert Hall, 1490 Chicago Avenue, Evanston. Tickets are $10 per family (up to six family members), available online or 847.905.1500 ext. 108. For more information visit musicinst.org. Esteemed U.S. conductor-arranger assumes role for the orchestra’s 2013–2014 season. Tyzik will conduct two Pops concerts during the current 2012–2013 season, including Holiday Pops, stepping in for the late Marvin Hamlisch. At a special event for Seattle Pops subscribers and Seattle Symphony donors, Executive Director Simon Woods announced that Grammy Award winner Jeff Tyzik has been named the Seattle Symphony’s Principal Pops Conductor. Tyzik’s contract will be for three years, for the 2013–2014, 2014–2015 and 2015–2016 seasons. Tyzik, who has earned a reputation as one of America's most innovative pops conductors, is recognized for his brilliant arrangements, original programming and engaging rapport with audiences of all ages. He has served as Principal Pops Conductor of the Rochester Philharmonic Orchestra for 19 years; he also serves as Principal Pops Conductor of the Oregon and Vancouver symphonies and The Florida Orchestra. His appointment will begin September 1, 2013. Grammy Award winner Jeff Tyzik is recognized as one of America's most innovative pops conductors. Described by the Rochester Democrat and Chronicle as “among the best pops conductors in America,” Tyzik is known for his brilliant arrangements, original programming and engaging rapport with audiences of all ages. Now in his 19th season as Principal Pops Conductor of the Rochester Philharmonic Orchestra, Tyzik also currently serves as Principal Pops Conductor of the Oregon Symphony and the Vancouver Symphony Orchestra. In 2012, he became the Principal Pops Conductor of the Florida Orchestra. In his nineteen years with the Rochester Philharmonic Orchestra (RPO), Tyzik has developed an incredible relationship with devoted Rochester audiences who appreciate his creative pops programming. Over the course of his tenure, he has written over 180 works for the orchestra. A consummate musician, Tyzik is so appreciated in Rochester that the RPO has taken the unusual step of inviting him to appear as a guest conductor in the orchestra’s classical subscription series calendar on a regular basis. On his classical series concerts, Tyzik has performed works by some of the greatest American composers to critical acclaim. He has also been commissioned to compose original works for orchestra, including his Trombone Concerto, which was funded by a grant from the National Endowment of the Arts and subsequently performed at Carnegie Hall. His Timpani Concerto, commissioned by the RPO, was premiered in January 2010. Tyzik led the world premiere of his original work New York Cityscapes with the Royal Scottish National Orchestra in June 2010. In May 2007, the Harmonia Mundi label released his recording of works by Gershwin with pianist Jon Nakamatsu and the RPO; the recording stayed in the Top 10 on the Billboard Classical chart for over 3 months. Alex Ross, music critic for The New Yorker, called it “one of the snappiest Gershwin discs in years.” In the 2012–2013 season, Tyzik will conduct the RPO on the subscription series in the world premiere of his new suite: Images: Musical Impressions of an Art Gallery. Highly sought after as a guest conductor, Tyzik has recently appeared with orchestras including the Boston Pops, the Cincinnati Pops, the New York Pops, The Philadelphia Orchestra at the Saratoga Performing Arts Center, the Los Angeles Philharmonic at the Hollywood Bowl, and the Dallas Symphony at the Vail Valley Music Festival. In addition to his commitments in Rochester, Oregon, Florida and Vancouver, during the 2012–2013 season he performs with orchestras across North America including the Detroit, Milwaukee and Toronto symphony orchestras. 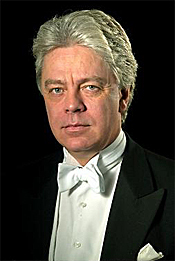 In June 2010, Tyzik made his UK debut in Edinburgh and Glasgow with the Royal Scottish National Orchestra in a three-week series of four popular programs. A native of Hyde Park, New York, Tyzik began his life in music at nine years of age, when he first picked up a cornet. 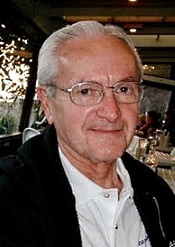 He studied both classical and jazz throughout high school, and went on to earn both his bachelor’s and master’s degrees from the Eastman School of Music, where he studied composition and arranging with Radio City Music Hall’s Ray Wright and jazz studies with the great band leader Chuck Mangione, both of whom profoundly influenced him as a musician. 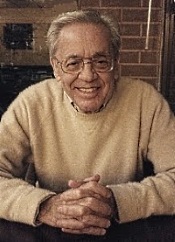 He also studied composition with American composer Samuel Adler who has greatly influenced his broad musical perspective. Tyzik spent the 1970s working with Mangione, soaking in every part of the music business. He became a skilled record producer and key member of Mangione's musical dynasty. He also wrote arrangements for the Maynard Ferguson and Woody Herman orchestras; and, later met and became an arranger and producer for the legendary Doc Severinsen. Tyzik worked closely with Severinsen on many projects including orchestrating many of the great bandleader’s symphony orchestra programs. Tyzik produced a Grammy Award–winning album, The Tonight Show Band with Doc Severinsen, Vol. 1, as well as four other recordings for Severinsen, which were honored with three additional Grammy nominations. 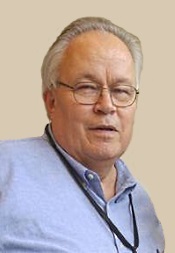 As an accomplished composer and arranger, Tyzik has had his compositions recorded by ensembles including the London Symphony Orchestra, the Rochester Philharmonic Orchestra and the Summit Brass, and his arrangements have been recorded by groups including Erich Kunzel and the Cincinnati Pops Orchestra, the RPO, the Vancouver Symphony Orchestra, and Doc Severinsen with the Royal Philharmonic Orchestra in London. He has also produced and composed theme music for many of the major television networks, including ABC, NBC, HBO and Cinemax, and released six of his own albums on Capitol, Polygram and Amherst Records. Committed to performing music of all genres, Tyzik has collaborated with such diverse artists as Tony Bennett, Art Garfunkel, Dawn Upshaw, Marilyn Horne, Arturo Sandoval, Wynonna Judd, The Chieftains, Mark O'Connor, Doc Severinsen, John Pizzarelli, Billy Taylor and Lou Rawls, and has created original programs that include the greatest music from jazz and classical to Motown and swing. He has recently conducted several orchestra programs for jazz superstar Chris Botti. Actively sharing his passion for music with others, Tyzik has been recognized for his community service and educational work by Rotary International, the Monroe County Music Educators and the Rochester Philharmonic League. He is also the recipient of the Arts and Cultural Council for Greater Rochester 2002 Performing Artist Award. He has received the Distinguished Alumni Award from the Eastman School of Music and was elected to the first ever class of the Rochester Musicians Hall of Fame in 2012. Tyzik currently serves on the Board of Managers of the Eastman School of Music. He lives in Rochester, New York, with his wife Jill. Chad Hoopes, the 18-year old violinist who plays far beyond his years, is using his talent for good. On November 1, 2012 at 7:30 pm at the Rose Wagner Performing Arts Center in Salt Lake City, UT, he will be lighting up the stage with an incredible repertoire all in the name of raising money for Crohn’s and Colitis Disease. Tickets are $20-50 and can be purchased by calling 355-ARTS. This event will benefit the Crohn’s and Colitis Foundation of America (CCFA), which is the leading non-profit organization dedicated to research and curing Crohn’s and Colitis disease. Founded in 1967, this volunteer-driven organization has contributed to the growing body of research and information used to help cure those suffering from Crohn’s. CCFA hosts fundraising events all around America, but this is a rare and exciting opportunity to help the cause and hear an incredible young musician share his gift to raise awareness for CCFA. Chad Hoopes will wow the audience with his generosity and his musical prowess. He will be performing his virtuosic interpretation of Ravel’s “Tzigane,” the captivating Sonata in A Major by Cesar Franck and Tchaikovsky’s “Mélodie”. He is bound to impress with these two works that he has mastered under the spotlight. His stunning musicality and rich sound have caught the attention of critics everywhere. As the Charlotte Observer noted, he plays “…with a young person’s enthusiasm combined with a veteran’s confidence” (Charlotte Observer, February 2012). He gained fame at just 13 when he won the Yehudi Menuhin International Violin Competition in Wales. It has been a whirlwind ever since, with a performance on PBS’s From the Top at Carnegie Hall, a concert with Robert Redford, and a solo for an Emmy-winning commercial under his belt. He is a violinist possessing vibrant virtuosity "with an inspiring blend of emotional expression and technical ease" (Press Democrat), and his mastery is described as "way beyond his years" (Press Democrat). Chad was born in Naples, Florida, in 1994 and at the age of four began his violin studies in Minneapolis. He later studied at the Cleveland Institute of Music under David Cerone and Joel Smirnoff and has additionally studied at Ottawa's NAC Young Artists Program. Chad is living in Cleveland where he is in his final year of high school. Come see this phenomenal young musician and support this important cause. As part of Opera Parallèle’s season of expanded community engagement activities and support for Opera America’s National Opera Week, the opera company joins efforts with Drew School to present a collaborative production of the children's opera The Araboolies of Liberty Street by Ronald Pererato at selected elementary schools November 1 and 2 and for family members and the general public 7:30 PM November 2 and 3 at Drew School's Samuel M. Cuddeback Theater, San Francisco. Artistic direction will be handled by staging intern Brendan Hartnett, Drew School's Music Director James Garrison and music teacher Lara Greene, under the guidance of Opera Parallele's resident Stage Director Brian Staufenbiel and Artistic Director/Conductor Nicole Paiement. Harnett is joined by soprano Maya Kherani, Opera Parallele's intern in education; pianist Ian Scarfe and percussionist McKenzie Camp to lead Drew School students in the preparation and performance of The Araboolies of Liberty Street. Perera’s children’s opera, with libretto by Constance Congdon, is based on the popular book by Sam Swope. The opera unfolds as the mean General Pinch keeps strict order on Liberty Street by threatening the residents with the possibility of an army invasion because they look different. The people live under a shadow of fear and gloom until the colorful Araboolies move in and shake things up. The children join forces to help the Araboolies and hatch a plan of revolution to bring liberty to Liberty Street. One of Opera Parallèle’s primary ambitions is to attract new and younger audiences for opera through intimate performances of contemporary masterworks given in settings appropriate to the music and staging. Opera Parallèle is a professional opera company-in-residence at San Francisco Conservatory of Music and the only organization in the Bay Area that presents contemporary opera exclusively. Most recently, Opera Parallèle presented the world premiere of Jacques Desjardins’s re-orchestration of John Harbison's The Great Gatsby. In collaboration with SFMOMA, the company presented the critically acclaimed production of the rarely performed Four Saints in Three Acts by composer Virgil Thompson and librettist Gertrude Stein and the world premiere of Luciano Chessa’s A Heavenly Act. In spring 2011 the group produced the Bay Area premiere of Philip Glass’ Orphée and in 2010, the chamber version of Alban Berg’s 20th century masterpiece Wozzeck. In February 2007, Opera Parallèle presented the world premiere of Lou Harrison’s opera Young Caesar in conjunction with what would have been the late composer’s 90th birthday. In prior years, with its mission more broadly focused on contemporary music, Opera Parallèle presented 125 performances including 28 world premieres, released 12 recordings and commissioned 19 new works. As a non-profit 501(c)(3) arts institution, Opera Parallèle must raise support and funds throughout the year to be able to present contemporary opera to a wide audience at affordable prices. This year, for the second time, Opera Parallèle is among the rank of noteworthy arts organizations that receive funding from San Francisco’s Grants for the Arts. Other foundational support comes from the Columbia Foundation, Zellerbach, and Fleishhacker. Additional information is available at operaparallele.org. Don’t miss this opportunity to experience Opera Parallèle’s, Ronald Perera’s The Araboolies of Liberty Street 7:30 PM on November 2 and 3 at Drew School, San Francisco. Tickets to the performances are free but must be reserved in advance. Please visit drewarts.ticketleap.com to reserve your tickets now. Music by Ronald Perera, libretto by Constance Congdon, based on the popular book by Sam Swope. Drew School's Samuel M. Cuddeback Theater, 2901 California Street, San Francisco. November 2 and 3 at 7:30 PM. Also, Sonata for 2 Violins; Sonata for Violin and Piano. 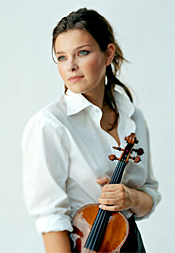 Janine Jansen, violin; Boris Brovtsyn, violin; Itamar Golan, piano; Vladimir Jurowski, London Philharmonic Orchestra. Decca B0017466-02. It’s always a pleasure welcoming another recording from violinist Janine Jansen, who never fails to provide a stimulating, energetic, compassionate, yet wholly traditional performance of whatever she’s performing. Here, she plays the Prokofiev Second Violin Concerto along with two of Prokofiev’s violin sonatas. They make attractive music. Russian composer Sergei Prokofiev (1891-1953) wrote his Violin Concerto No. 2 in G minor, Op. 63, in 1935, just before he returned from a self-imposed exile from Russia and while turning to what he called a “new simplicity” in his music. The Concerto starts with a lonely violin solo that gets only a little bit hectic before settling down to a more modest, plaintive tone. Prokofiev was obviously softening his earlier dissonant style and relying more on melody, perhaps to appease the ultraconservative Russian musical censors of the day, who seemed to appreciate his new attitude. Ms. Jansen begins by playing the Allegro moderato sweetly, with only a tinge of melancholy in a beautifully lyrical performance. Although it perhaps lacks something of the urgency of Heifetz’s old RCA recording, it makes up for it in its soaring lines and delicate nuances. Ms. Jansen’s interpretation emphasizes the beauty and poetry of the piece yet doesn’t overlook its strength. Incidentally, she plays a 1727 “Barrere” violin by Stradivari, and I can’t imagine its sounding any better in the past 200-odd years. Following the opening movement, we find an Andante assai, with gently lilting melodies above a rhythmic arpeggio accompaniment and never sounding lovelier. Finally, Prokofiev closes the show with a pulsating, waltz-like finale featuring ever more-pronounced percussion elements overtaking the Gypsy swirls of the violin. Ms. Jansen gives the instrument a workout as the music comes to a sudden, climactic halt. Regarding the two accompanying pieces, Prokofiev wrote the Sonata for 2 violins in C major, Op. 58, at about the same time as the Second Violin Concerto, and it displays a similar simplicity, which Ms. Jansen exploits nicely. The Sonata for violin and piano in F minor, Op. 80 no. 1, however, is much darker, a memorial for colleagues who disappeared under Stalin’s regime. 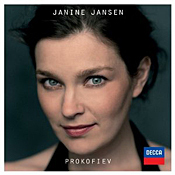 It stands in stark contrast to the relatively unadorned grace and directness of the other two works, and again Ms. Jansen handles it appropriately, adding a touching solemnity to the occasion. 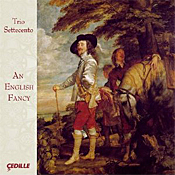 Decca recorded the Concerto at Henry Wood Hall, London, and the two Sonatas in Teldex Studio, Berlin, in 2012. The sound throughout comes up nicely defined, if just a touch hard. In the Concerto the engineers recorded the violin fairly closely for maximum detail, but the orchestra offers a good sense of depth. There is also a strong, deep bass response when needed, as well as quick transients, especially noticeable in the Concerto’s final movement. The recordings of all three works are clear and firm in the best Decca tradition. Also, Bruch: Kol Nidrei; Tchaikovsky: Variations on a Rococo Theme. 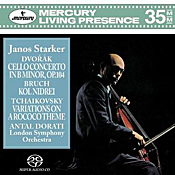 Janos Starker, cello; Antal Dorati, London Symphony Orchestra. Mercury SACD 475 6608. 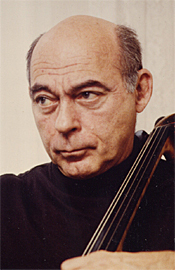 I’ve always thought of Janos Starker’s interpretation of Dvorak’s Cello Concerto on Mercury as typically masculine. Certainly, other men have essayed the work with equal poise and distinction from Gendron (HDTT) to Wallfisch (Chandos) to Rostropovich (DG) to Ma (Sony), but none of them seem to me to convey the same strength, the same virile character as Starker does. Starker’s version is a remarkable performance, indeed, although (to be punny) it may strike some listeners as a little too stark. The real downside, you see, is that Starker gives up something in warmth and humanity--sensitivity, if you will--in his interpretation. He plays the piece with a clinical precision that rather overshadows the work’s romanticism, especially in the slow movement. Still, for the outright vigor of the piece, I have always favored Starker above everyone else. But maybe I’m also just comparing sound quality here. For years I owned the 1962 Mercury recording on vinyl; then in the Seventies I bought it on a special Japanese audiophile LP; and in the early nineties I welcomed the Mercury Living Presence CD issue, remastered by the original producer, Wilma Cozart. This current SACD hybrid preserves Cozart’s CD mix (a new transfer of the old master) and adds a new three-channel rendition as well, if you have the player and speakers to accommodate it. In two-channel stereo, as I listened, it sounds as sharply delineated as ever, perhaps even clearer in the new SACD mode, with a wide, well-balanced stereo spread, and a cello that appears to be in the very room with the listener. No other recording of the work sounds as natural or as impressive as this one, although the Gendron from HDTT comes close. Couple the Cello Concerto to a lovely reading of Max Bruch’s Kol Nidrei and a less-interesting but still well recorded version of Tchaikovsky’s Variations on a Rococo Theme, and you get a splendid album. If you don’t already own the CD, I suggest you at least give a listen to this SACD. Also, Totentanz; Fantasy on Hungarian Folk Tunes. Nareh Arghamanyan, piano; Alain Altinoglu, Rundfunk-Sinfonieorchester Berlin. PentaTone Classics PTC 5186 397. This is only the second album for the relatively young Armenian pianist Nareh Arghamanyan, her first being a program of Liszt and Rachmaninov sonatas a couple of years earlier for the Analekta label. Audiences perhaps know her best for winning a slew of piano competitions over the past decade, things like the 2009 “Sparkasse Wortersee” Competition in Austria; the 2008 Montreal International Musical Competition; the 2007 Piano Campus International piano competition, Pontoise; the 1999 Armenian Legacy, First National piano competition, Armenia; the 1998 International Competition "Little Prince" for young talents in Zaporozhye, Ukraine; and the 1997 International Frederic Chopin Piano Competition in Yugoslavia. Here, she makes a good showing in the two Liszt Concertos, the Totentanz, and the Fantasy on Hungarian Folk Tunes. Hungarian pianist and composer Franz Liszt (1811-1886) started writing his Piano Concerto No. 1 in E-flat Major around 1830 and worked on it for a quarter of a century, finally committing it to paper in 1849, and premiering it in 1855. You might say he had plenty of time to perfect it. The fascinating thing about the First Concerto is that even though we usually hear it in three distinct movements--a traditional opening Allegro, a slow Adagio combined with a vivacious Scherzo, and then an Allegro finale--the movements are really like one continuous piece, with variations on common themes throughout. The First Concerto begins in a big, grand manner, in the style of Beethoven, Schumann, Grieg, and Tchaikovsky, and Ms. Arghamanyan, Maestro Alain Altinoglu, and the Berlin Radio Symphony Orchestra play it in just such a big, grand fashion, plus. Yet Ms. Arghamanyan is quite sensitive and, of course, most virtuosic. So she handles both the grand statements and the more-poetic ones with equal ease. Moreover, Altinoglu conducts with a deft touch, lending a bravura accompaniment at times and a quiet support when needed. The heroic opening theme comes through in dazzling style, the lyrical second-movement Quasi-Adagio is as sweet as one could imagine, and following without a break the Scherzo and then the Allegro finale proceed in exemplary fashion. Unlike my recent listening to another young virtuoso pianist, Lang Lang, doing Chopin in a manner I felt was more for effect than anything else, I found Ms. Arghamanyan’s playing searing and soulful. While her renditions of the Liszt concertos may not be quite up to those of Sviatoslav Richter (Philips), Alfred Brendel (Philips), or Leonard Pennario (HDTT), they are close. Liszt began his Piano Concerto No. 2 in A Minor in 1839, some sixteen years before premiering the Concerto No. 1, which is why you’ll sometimes find No. 2 listed first on a recording, although not here. The Second Piano Concerto is more like a typical Liszt tone poem than the First, so it’s a little different from what most other composers were writing at the time. As Liszt said, “New wine demands new bottles.” The Second Concerto is less overtly virtuosic than the First, and more rhapsodic, yet it displays any number of melodramatic elements as well. Ms. Arghamanyan again negotiates it dexterously, and aided by PentaTone’s excellent sonics, she and the orchestra make the most of the work. The two couplings for the concertos also come up well. The Totentanz (“Dance of the Dead”), based on variations of the Dies irae, sounds appropriately menacing, if a bit softer in spots than I’d like. The Fantasy on Hungarian Folk Melodies will remind listeners of another of Liszt’s famous works, the Hungarian Rhapsody for Piano No. 1 (and the Hungarian Rhapsody for Orchestra No. 14). He believed in getting the most out of his music, and Ms. Arghamanyan plays it charmingly. PentaTone recorded the music in both stereo and surround for this hybrid SACD at Haus des Rundfunks, RBB, Berlin, in April, 2012. They obtain from the orchestra some of the best sound I’ve heard on a PentaTone release. The Berlin Radio Symphony displays a wonderful depth, air, and transparency, not only in the SACD stereo mode to which I listened but in the regular stereo mode, too, without sacrificing naturalness, smoothness, or warmth. The slight snag is that PentaTone recorded the piano rather closely, and it sometimes dominates the rest of the ensemble. While the piano should be front and center, here it tends to stretch a bit too far across the stage and can at times overwhelm the orchestral support. Nevertheless, even though the recording doesn’t always simulate the most realistic balance between the soloist and orchestra, it does offer a dramatic effect, which in the First Concerto, being as dramatic as it is, anyway, is not entirely a bad thing. Overall, this is probably the best new Liszt recording you’ll find. Placido Domingo, chorus, orchestra, and friends. Sony Classical 88691934932. 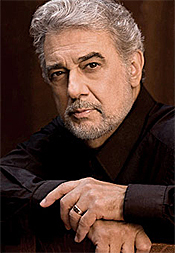 Spanish tenor and conductor Placido Domingo (b. 1941) has been making beautiful music since his stage debut in 1959, undertaking over 140 operatic roles, leading any number of orchestras, and recording over 100 albums. The present disc, Songs, is his first pop album in over twenty years. 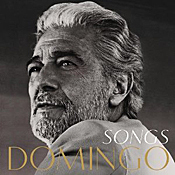 Looking more and more like “The Most Interesting Man in the World,” Domingo may well be the greatest singer in the world. Heck, he may be the greatest singer of all time; his fans will no doubt agree, and it’s hard to argue against the point. This time out he sings fourteen pop numbers, all favorites of his, on eight of them accompanied by other noteworthy artists: singers Josh Groban, Harry Connick Jr., Zaz, Katherine Jenkins, Susan Boyle, Placido Domingo Jr., actress and singer Megan Hilty, and trumpeter Chris Botti. Domingo opens the show with “Cancion para una reina,” a love song of exquisite beauty, which the singer caresses with subtle care. Next, we hear “Sous le ciel de Paris” in a duet with Josh Grobin; it’s lighter and a tad more upbeat than the first tune, the two men’s voices blending wonderfully but Domingo’s clearly the more powerful. “Time After Time” features Domingo with Harry Connick Jr., and it has a breezy Sinatra-like style to it. Although Domingo and Connick have about as different voices as you can imagine, they make it work by approaching it in a casual, easygoing manner. You can usually sense Domingo holding back somewhat in his duets so as not to steamroll his singing partner. Now in his seventies, he’s still got the strong, mellifluous voice; the impeccable inflections; the emotional range and power; and the pure communications skills of a great vocal artist. He may go on forever; one can only hope. After wowing audiences across Europe last season, the powerful and poetic young pianist Nareh Arghamanyan sets her sights on the U.S. this fall. 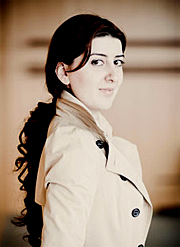 Arghamanyan comes to New York on October 28th at Lincoln Center's Walter Reade Theater (165 West 65th Street) at 11:00 a.m.
American fans of her Rachmaninoff recital, released in April 2012 by Dutch label Pentatone Records, will have a chance to experience her signature blend of “technical bravura, singing tone, and poetic expression” (La Scena Musicale) in person. Her ambitious and immensely satisfying program features J.S. Bach’s Partita No. 2 in C minor (BWV 826), Robert Schumann’s Fantasiestücke (Op. 12) and a healthy dose of Super Audio CD Rachmaninoff, including selections from Morceaux des fantaisie (Op. 3) and Etudes de tableaux (Op. 33), plus a complete performance of the composer’s savagely difficult Variations on a Theme by Corelli in Philadelphia. 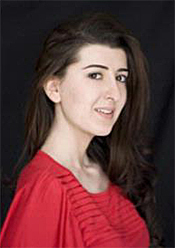 Of her Rachmaninoff recording, Gramophone’s Geoffrey Norris writes that Arghamanyan “clearly experiences Rachmaninoff’s music intensely.” The Independent called her playing “compulsive, emotional yet remarkably ‘complete’ for such a young musician – sensitive, unaffected, genuine.’’ Her deep connection to this repertoire is unsurprising considering her early introduction to the piano, which was as emotionally powerful as it was peculiar. When a devastating earthquake hit her homeland of Armenia in 1989 (the year she was born), electricity and water were knocked out for the next five years. One night, when Nareh was 3 ½ years old, her mother used the piano as a “toy” to placate her stir-crazy daughter. Nareh began experimenting on the keyboard by candlelight for hours on end, with the sound of the piano becoming her greatest comfort in that time of darkness. Her parents signed her up for music school the next day! After a stunning New York debut at the Frick Collection in 2010, Nareh’s return to New York City on October 28 to make her Lincoln Center debut at the popular Sunday Morning Coffee Concerts series has received considerable buzz, and tickets are nearly sold out. The recitals presented by the Gardner Museum in Boston and the Philadelphia Chamber Music Society are in equally intimate venues, allowing audiences a close-up view of Nareh’s considerable star quality. For fans and curious music lovers that are not able to catch one of Nareh’s performances this October, a new recording of Liszt concertos from Pentatone comes to the rescue. If Rachmaninoff allows her to tap into music’s transcendent, emotional core, the two Liszt concertos stretch both her technical and interpretative abilities, demonstrating her versatility and sensitivity to tone and style. On the recording, released in the U.S. on October 30th, she performs Liszt’s epic Piano Concertos Nos. 1 and 2, as well as Totentanz (Dance of Death, paraphrase on “Dies irae”) and Fantasy on Hungarian Folk Tunes with the Rundfunk Sinfonieorchester Berlin conducted by Alain Altinoglu. The Music Institute of Chicago presents esteemed performers and ensemble-in-residence WarnerNuzova Saturday, November 17 at 7:30 p.m. at Nichols Concert Hall, 1490 Chicago Avenue, Evanston. World-renowned American cellist Wendy Warner and eminent Russian pianist Irina Nuzova have earned critical acclaim for their riveting performances. The performers’ contrasting cultures and traditions are at the core of the energy and insight of their interpretations. Their Nichols Concert Hall program includes two works by Beethoven-- Variations on a Theme from Handel, Judas Maccabeus, and Sonata for Cello and Piano No. 3 in A Major, Op. 69--as well as Leo Janacek’s Pohádka and Sergei Prokofiev’s Cello/Piano Sonata in C Major, Op. 119. Moscow-born Irina Nuzova studied at Juilliard following rigorous training in Russia, while American Wendy Warner earned her renown as a soloist at the Curtis Institute in Philadelphia under the baton and tutelage of the great Rostropovich. Warner and Nuzova first came together in 2008 out of a shared interest in performing canonical works that feature equal cello and piano parts, as well as commissioning unique arrangements and new music. As homage to their respective backgrounds, the women favor Russian and American repertoire, exploring the commonalities and “dissonances” between the two cultural heritages. WarnerNuzova performs Saturday, November 17 at 7:30 p.m. at Nichols Concert Hall, 1490 Chicago Avenue, Evanston. Tickets are $30 for adults, $20 for seniors and $10 for students, available online or 847.905.1500 ext. 108. For more information visit musicinst.org. The National Philharmonic, a Montgomery County-based ensemble in residence at the Music Center at Strathmore, has been named the winner of the American Prize in Orchestral Performance – Professional Division 2012. The American Prize is a series of new, non-profit national competitions providing professional adjudication and recognition for the best recorded performances of music by ensembles and individuals each year in the United States at the professional, college/university, church, community and secondary school levels. Administered by the Hat City Music Theater Inc., a nonprofit organization based in Danbury, Connecticut, the American Prize was founded in 2009 and is awarded annually. The American Prize competitions are open to all U.S. orchestras. The National Philharmonic was also the 2010 and 2011 winner of the Washington Area Music Association’s WAMMIE award for top-ranked Classical Orchestral Ensemble. WAMMIES are awarded each February and the 2012 award will be announced in January 2013. Led by dynamic Music Director and Conductor Piotr Gajewski, the National Philharmonic is known for performances that are “powerful,” impeccable” and “thrilling”(The Washington Post). The Philharmonic boasts a long-standing tradition of reasonably priced tickets and free admission to all young people age 7-17 under the All Kids, All Free, All the Time program, assuring its place as an accessible and enriching component in Montgomery County and the greater Washington, DC area. In resident at the Music Center at Strathmore, the National Philharmonic showcases world-renowned guest artists in time-honored symphonic masterpieces conducted by Maestro Gajewski and monumental choral masterworks under National Philharmonic Chorale Artistic Director Stan Engebretson. The National Philharmonic also offers exceptional and unique education programs. Each year, in partnership with Strathmore and Montgomery County Public Schools (MCPS), the Philharmonic performs for nearly 20,000 MCPS 2nd and 5th graders. Throughout the year, the Philharmonic offers master classes in which talented young musicians are mentored by critically acclaimed guest artists. All National Philharmonic concerts are preceded by free pre-concert lectures. In addition, each summer the National Philharmonic’s String and Choral Institutes offer talented and aspiring middle and high school musicians an intensive week of mentoring, coaching, master classes and individual lessons. The continued success of FAYM programs depends on donations from caring and generous supporters. FAYM is a registered 501(c)(3) Non-profit Charitable Organization (EIN Number 26-1472871), and your donation is tax deductible. Visit GuideStar to see what others are saying about FAYM: http://greatnonprofits.org/whitelabel/reviews/foundation-to-assist-young-musicians. FAYM operates to maximize each contributed dollar. There is no office rent, utility costs, or administrative salaries. All accounting and legal services are generously contributed pro bono. Stipends are given our professional instructors who commit their time for below current rates. That means that your donation, small or large, will reach the intended target in the form of Scholarships and cost-free Instructional Programs for Young Musicians. For information about establishing a Named Scholarship within the Foundation or to inquire about creating an Estate Gift, please contact the Trustee, Harold Weller, at FAYM@live.com or visit the Web site at http://thefaym.org/ or http://thefaym.org/donate/. 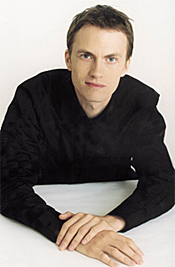 Alexandre Tharaud, piano, and friends. Virgin Classics 50999 602552 2 8. 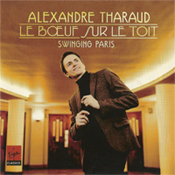 French pianist Alexandre Tharaud tells us that he has had an interest since childhood in the pop and jazz music of the 1920’s, especially the music played in the famous Parisian nightspot Le Boeuf sur le Toit. I also suspect that the popularity of Woody Allen’s 2011 motion picture Midnight in Paris, in which his main character goes back in time to the Paris of the Twenties, may have also influenced Tharaud’s decision to record the two-dozen or more tunes he does on the present CD. Whatever the genesis of the album may be, it’s a delight from start to finish, with Tharaud supported on several of the tracks by David Chevallier, banjo, and Florent Jodelet, percussions. What’s more, pianist Frank Braley, and singers Madeleine Peyroux, Juliette, Natalie Dessay, Behabar, Guillaume Gallienne, and Jean Delescluse join Tharaud on a select few songs. It’s hard not to like this music. The program opens with Tharaud playing a solo arrangement of Chopinata, a jazzy collage of Chopin tunes put together by one of Tharaud’s piano heroes of the Twenties, Clement Doucet. Tharaud follows that with a number of piano arrangements by George Gershwin, Cole Porter, Nacio Herb Brown, Al Lewis, W.C. Handy, and the like. But it’s not all purely jazz and pop. Tharaud intersperses pieces by classical composers affected by jazz: Maurice Ravel, Darius Milhaud, the aforementioned Chopin, and a really enterprising fox trot by Doucet based on themes by Franz Liszt. Tharaud plays with verve and conviction, clearly reveling in a love for the music and finding the soul in it. He never tries to embellish it or hype it; he simply feels it, gently and delicately, and lets it flow lovingly from his piano. Moreover, his occasional guests make their own unique, wholly appropriate contributions, adding to the authentic feel of the music and songs. A penultimate arrangement of Handy’s St. Louis Blues for harpsichord is fascinating, the entire show offering up high good fun. Virgin Classics recorded the music in early 2012 at three locations: Ircam, Cite de la Musique, and Salle Colonne, all in Paris, France. The sound is warm and inviting, with a smooth vibrancy and a laudable clarity. One can almost picture the performers in a bustling cabaret, the imaging is that precise. There is also a strong dynamic impact and a rich acoustic resonance to help produce an overall lifelike response. Also, Concertos for 3 & 4 Violins. Christopher Warren-Green, London Chamber Orchestra. Virgin Virgo 7243 82005-2. 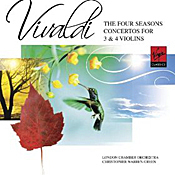 Another installment of Classical Candor, another Vivaldi Four Seasons. The recordings of this perennial favorite appear as regularly as changes in the weather. But because the Four Seasons come in a variety of flavors and dozens upon dozens of recordings, before I get into this current release, let me recap some of my own personal favorites in various configurations. For modern chamber orchestra, I like the unique, almost surreal account by Neville Marriner and the Academy (Decca), the sane and sensible reading by I Solisti Italiani (Denon), and the refined and elegant rendition from Michelucci and I Musici (Philips Eloquence), which also benefits from a budget price. For a period-instruments interpretation, there’s the exemplary version by the Philharmonia Baroque Orchestra (PBO), the deftly fascinating one by Kuijken and La Petite Bande (Sony), the highly original rendition from Sparf and the Drottningholm Baroque Ensemble (BIS) the stimulating Tafelmusik (Sony); the more conservative Pinnock-English Concert (DG Archiv); and to get the adrenaline flowing, Biondi and Europa Galante (Virgin Veritas). Finally, for a big, modern group and a thoroughly polished presentation, there’s Perlman and the LPO (EMI). So, where does Warren-Green’s 1989 reissue with the London Chamber Orchestra fit into the scheme of things? Well, obviously, because they are a small, modern chamber group, their main competition includes Marriner, I Solisti Italiani, and I Musici. But the speeds Warren-Green and company adopt are more in line with Europa Galante, meaning they take things lickety-split. You get a little of both worlds, modern and period-instruments in the performance. Not that this is entirely good, however, as the music sometimes seems too hurried to give much emphasis to the picturesque quality of the tone poems involved. There’s not a lot of color in some of the interpretations, like the opening of “Winter,” as there is pure energy. Still, it’s invigorating. It’s also nice to have the two fill-ups: the Concerto for 3 Violins, RV 551, and the Concerto for 4 Violins, RV 580. The sound of the solo violin on Virgin’s reissue of their original 1998 release is a tad sharp and bright, but the body of the instruments sounds just right, if a little bass shy. Stereo spread is good; depth is inconsequential with so small a group, but it’s a trifle flat; and overall balance and definition are also good. This would not be my number-one choice for the repertoire, but I wouldn’t completely discount the disc, either, especially not when the folks at Virgin Classics now make it available for a bargain price. Robert Haydon Clark, Consort of London. Brilliant Classics 94413. J.S. Bach wrote quite a lot of music for the orchestra, but most of it was in the way of concertos. Interestingly, his four Orchestral Suites, French-influenced Baroque forms much favored in his day, also include extensive parts for solo instruments with ensemble backup. 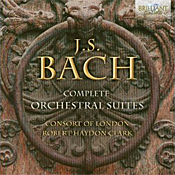 Certainly, we’ve had enough recordings of the Orchestral Suites, but this one from 1990 with Robert Haydon Clark leading the Consort of London is welcome just the same. Nobody knows exactly when Bach wrote these Suites. Even though they have catalogue numbers of BWV1066-1069, it doesn’t mean much since the numbering system isn’t necessarily chronological but by genre. However, some recent researchers believe that Bach may have written the Suites during the years 1716-1723, later revising them between 1725 and 1739 in the arrangements we know today. What’s more, Bach didn’t even want to call them “suites,” although they are sets of five to seven movements each; he called them “overtures,” a custom of the day in referring to a complete set by its first movement only. Anyway, when he wrote them and what he called them are beside the point; the main thing is that they continue to entertain us with their wit and charm. From what little I can gather about the Consort of London, they play on instruments made in the seventeenth and eighteenth centuries. To be fair, though, the instruments don’t actually sound “period”; they appear tuned to modern values, and they sound, for all intents and purposes, like modern instruments. I dunno. The main thing is that the Consort play in a lively fashion, and all four suites fit neatly onto a single disc. The Consort’s playing sounds consistently stylish and refined, and Clark leads them in generally well-judged tempi, never so fast that they disfigure the music, yet never so slow that they ever feel sluggish. More important, Clark maintains a hearty rhythmic pulse in every segment, with pointed contrasts and a smooth flow. If I had to criticize anything, it might be that from movement to movement one doesn’t hear as much difference in pacing or emphasis from Clark as one hears from some other conductors. In other words, in faster movements Clark is sometimes a tad slower than we expect, while in slower movements he’s a touch faster, creating a kind of sameness to each suite as a whole. But I quibble. Clark handles the dance tunes throughout with an uncommon grace, the flute in No. 2 and the trumpet in No. 4 especially felicitous. Then there’s No. 3 with its familiar overture and famous “Air” that come off in regal, graceful fashion. There’s simply not much to complain about here. 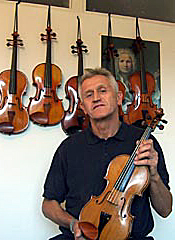 Among my own favorites in this music on modern instruments are still the recordings of Sir Neville Marriner and the Academy of St. Martin in the Fields (Decca-Argo) and Raymond Leppard and the English Chamber Orchestra (Philips); and on period instruments Jordi Savall and Les Concert des Nations (Astree), Ton Koopman and the Amsterdam Baroque Orchestra (DHM), Martin Pearlman and the Boston Baroque Orchestra (Telarc), and Sigiswald Kuijken and La Petite Bande (DHM). 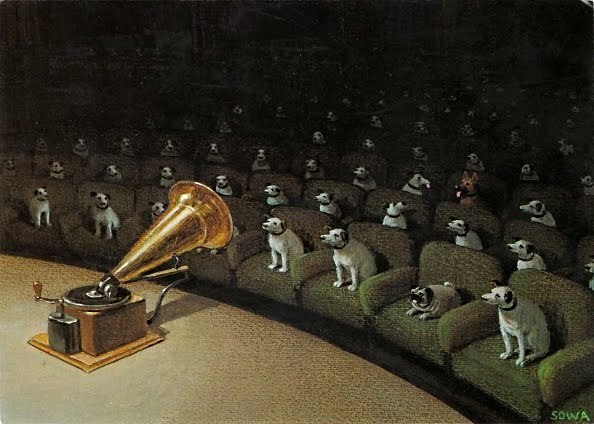 Although I don’t find Clark’s renditions of the music quite fitting into this company, he would not be entirely out of place among them, either. Originally recorded by Phoenix Music UK at Henry Wood Hall, London, and issued by Collins Classics in 1990, Brilliant Classics have re-released it in 2012. The sound is reasonably rich and crisp. Even if it hasn’t a lot of depth or air, it does provide a realistic orchestral spread, with good balance amongst the instruments. There could be, perhaps, a bit more heft in the upper and mid bass to offer greater weight and maybe a stronger dynamic impact, but these are relatively minor concerns. Overall, there are few if any Bach Overture recordings as sonically satisfying as this one. On November 2, The King’s Singers bring their unparalleled artistry to Carnegie Hall with a program of masterpieces and delights from the Renaissance to the Twentieth Century, music that explores stories from the imagination and from human experience: that program is, appropriately, Myths. 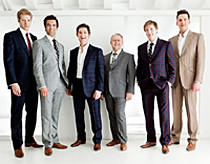 One of the world’s most popular vocal ensembles in any style or genre, The King’s Singers have a musical range that demolishes boundaries, connecting Early Music, modern compositions and pop — from Gibbons to Ligeti to Michael Bublé. Along with being exceptional vocalists, the group of singers are also famous for witty and polished performing artistry. A King’s Singers performance charms, delights and touches the heart. 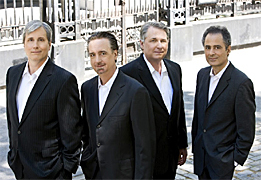 Their discography comprises over 150 recordings, including their 2009 Grammy® award winning album Simple Gifts. The newest release, Royal Rhymes and Rounds, is a unique survey of music written for, and even by, the English court from the 16th to 20th centuries, and the group is also touring a program this fall based on music from that release and concerts given to celebrate the Diamond Jubilee of Queen Elizabeth II. Those concerts add to The King’s Singers extensive, worldwide performing career, one that also includes radio and television broadcasts. With Myths at Carnegie Hall, the ultimate vocal group explores madrigals, the ultimate vocal music, relying on their precise technique, passionate expression and assured musicality that are the singers’ hallmarks. Bass Jonathan Howard says of the concert “Myths is a fascinating program, interweaving Renaissance madrigals with modern works that carry us through disparate and often challenging cultures. We travel through Grecian woodlands filled with magical creatures, indulge in a Bacchanale before Lent's penury begins, endure the hardships of Winter and journey along Spain's oldest route of pilgrimage beneath the burning heat of the midday sun. At the beginning of the second half, we are divorced from reality entirely, with tales of comically pointy chins, aggressive old women, and snake-confounding flautists from some of Edmund Lear's most famous Nonsense Poetry. We and our audience will returning to reality at the end of the concert, when we finish with a selection of popular close-harmony songs, taken from the lighter side of The King's Singers' repertoire. We hope you enjoy the journey as much as we do!" At the core of Myths is the late Sixteenth Century collection of Italian madrigals, Il Trionfo di Dori, itself the inspiration for the English collection, The Triumphs of Oriana. From each book comes works from Thomas Morley, Edward Johnson, Thomas Weekes (representing The Triumphs) and Giovanni Croce, Giovanni Gabrieli and Palestrina (Il Trionfo). The stories behind the madrigals come from pagan roots, and so were secular for the times, and this is a unique opportunity to hear non-liturgical music from the great master, Palestrina. The English music is dedicated to the first Queen Elizabeth, known via one of her nicknames as Oriana, and uses the thread of myth to honor and glorify her. Popular at the time, the music now is a triumph of English national pride and style. Interleaved with the madrigals are Camille Saint-Saens Saltarelle, not strictly a myth, but a fable of the church casting a blind eye on the perhaps excessive celebration of Carnival in a country village. Francis Poulenc’s Un soir de neige takes words from Paul Eluard about fighting for the French Resistance in WWII and spins them into a dramatic picture of war and sacrifice. The most recent pieces on the program, Leon from Joby Talbot and Goffredo Petrassi’s famous, wonderful Nonsense, are being shared with other programs from The King’s Singers this fall, the latter with the aforementioned Riddles, Rhymes and Rounds (from Royal Rhymes and Rounds) and former as a key feature of an exciting project, Travel Songs, which has the singers collaborating in performance with choreography and dance from the Sean Curran Dance Company. Leon is music that conveys the experience of the famous Cathedral Leon, a key point in the important Camino Frances Catholic pilgrimage, while Nonsense is a contemporary madrigal that loves the form musically and gently teases it lyrically, with it’s nonsense verse from Edward Lear. Rounding out the Myths is popular music that has been integral in creating modern myths of popular culture, ideas about how to dress and think and feel and live. The Singers will tell charming stories through seminal works from the pop and jazz world, using the music of some of the greatest musicians and lyricists of the twentieth century. These are stories exploring regular, flesh and blood human beings, not gods or history or ideas and beliefs, but the reality of life and love and loss. And, in the final measure, it’s all singing. From The King’s Singers. Strathmore announces the addition of nine concerts in the Music Center and Mansion. The arts center has increased its offerings in the Music Center with a stellar selection of distinctive and thought provoking performers, including the dynamic Olivia Newton-John, NPR hallmark Ira Glass, the incomparable Béla Fleck, show-stopping Gladys Knight, Dave Koz with a cadre of music friends that includes drummer Sheila E., and the 2013 Spring Gala at Strathmore headliner, Michael Feinstein. Enterprising jazz pianist and composer Dan Tepfer returns to the Mansion at Strathmore to debut his latest album during a Music in the Mansion season enhanced by pianist Alain Lefèvre performing the Washington area premiere of Francois Dompierre’s “24 Preludes” and the bold Now Ensemble. Tickets for all concerts are on sale now to Strathmore Stars, the art center’s philanthropic program that supports arts programming, education programs and community outreach projects. Tickets will be available to the general public beginning Thursday, September 27, 2012 at 10 a.m. The Bach Sinfonia will perform George Frideric Handel’s Music for the Royal Fireworks and Concerto Grosso in D Minor, Op. 3, No. 5 as well as works by the next generation of English composers – Charles Avison, Capel Bond and William Boyce on Sunday, October 21 at 3PM. Baroque trumpeter Joshua Cohen will be the featured soloist for this performance, which will include the North American premieres of Bond’s Concerto for Trumpet in D Major and Avison’s Concerto in B-flat Major, Op. 6, No. 5. A free pre-concert discussion precedes this and all Bach Sinfonia performances at 2:25 PM led by Daniel Abraham. Handel’s Music for Royal the Royal Fireworks is widely regarded as one of his most famous works for orchestra along with his Water Music – both of which were originally written to be performed outdoors. George II of Great Britain commissioned Fireworks as a wind band suite to accompany a fireworks display in London celebrating the end of the War of Austrian Succession and the signing of the Treaty of Aix-la-Chapelle in 1748. William Boyce (1711-1779) is recognized as England’s greatest native composer of the 18th century. His symphonies were widely circulated and performed after their publication in 1760 by the London publisher John Walsh. The Symphony No. 5, originally title Overture to St. Cecilia features a regal pair of trumpets alongside oboes, string and continuo. Charles Avison (1709-1770), a prodigious musical essayist and composer, spend his entire career in the Newcastle upon Tyne despite being offered multiple prestigious positions throughout England at various times during his lifetime. Best know as an organist, holding positions at St John the Baptist Church and St. Nicholas’s Church (later the Cathedral) in Newcastle, Avison published seven sets of concertos including three (Opp. 2, 3 & 6) in full score, a rarity in music publication at the time. His Op. 6 concertos show a strong engagement with the newly prevailing more classical gallant style and a sharp contrast to Handel’s high Baroque compositions. Capel Bond (1730-1790) was a renowned organist who served posts at two churches—St Michael’s and Holy Trinity in Coventry—for forty years. Bond’s only surviving works are his Six Concertos in Seven Parts (published by Walsh in 1766) and his Six Anthems (published by Walsh in 1769). They were very well received as both received multiple printings. The first concerto, with solo trumpet, probably dates back to 1754. Joshua Cohen is a baroque trumpeter who specializes in the playing of the florid and high in tessitura clarino parts on the baroque trumpet. He has appeared as soloist in many leading North American ensembles, is the principal trumpet for Bach Sinfonia as well as the Washington Bach Consort, and many other baroque ensemble around North America. He has recorded several CDs, including a Juno award-winning performance of music by Vivaldi with the early music ensemble Aston Magna. The Bach Sinfonia is a Maryland-based organization dedicated to excellence in performance and public education of Baroque and Classical music. Lead by Conductor and Artistic Director Daniel Abraham, the ensemble is now in its 18th season of presenting an annual series of unique concerts, open dress rehearsals, and listening lectures of music from the seventeenth and eighteenth century. Sinfonia strives to create programs that differ from the standard classical music concert with performances that aren't just listening entertainments but are also learning experiences. Longwood Gardens presents the inaugural International Organ Competition, where up-and-coming organists will compete on The Longwood Organ for a $40,000 first prize. This is the largest cash prize of any organ competition in the world and applications are being accepted through November 1st, 2012. Applications are available at www.longwoodgardens.org/organcompetition. Open to ages 18-30 years old, only the first 100 applicants will be accepted. “The Longwood Gardens International Organ Competition is about recognizing and nurturing the brightest young talents in the organ world,” said Longwood Gardens Director Paul B. Redman. “We have already received applications from throughout Europe and North America and look forward to showcasing these talented musicians at Longwood Gardens in June,” Redman said. Preliminary and final rounds are June 18-22, 2013 in the magnificent ballroom at Longwood Gardens near Philadelphia, Pennsylvania. A distinguished panel of experts will judge the competition including Paul Jacobs, Chair of the Organ Department at The Juilliard School; Thomas Murray, Professor of Music at Yale University; Oliver Condy, Editor of BBC Music Magazine; Sophie-Véronique Cauchefer-Choplin, Titular of the Grand Orgue of Saint Jean-Baptiste de la Salle in Paris; and Peter Richard Conte, Grand Court Organist of the renowned Wanamaker Organ and Principal Organist at Longwood Gardens. The Longwood Organ is among the world’s largest concert organs, with 146 ranks and 10,010 pipes. After a seven-year restoration completed in 2011, the organ is restored to its original 1930 condition and incorporates today’s most innovative technology. The winner receives the $40,000 Pierre S. du Pont First Prize, a contract with Phillip Truckenbrod Concert Artists, and a 2013-14 performance at Longwood. Second place receives the Firmin Swinnen $15,000 prize and third place receives the Clarence Snyder $5,000 prize. Swinnen and Snyder were past resident organists at Longwood. Again, applications are available at www.longwoodgardens.org/organcompetition. Longwood Gardens is one of the world’s great gardens, encompassing 1,077 acres of gardens, woodlands, meadows, fountains, a 10,010-pipe Aeolian organ and a 4-acre conservatory. Longwood continues the mission set forth by founder Pierre S. du Pont to inspire people through excellence in garden design, horticulture, education and the arts. More information at www.longwoodgardens.org. Some of the best classical musicians in the UK are taking time out of their busy performing schedule and swapping their instruments for cricket bats to raise money for Leukaemia & Lymphoma Research and for the Musicians Benevolent Fund. Members of the City of Birmingham Symphony Orchestra are heading to the MCC Cricket Academy at Lord’s, the home of cricket, to pitch their skills against eight cricket teams made up orchestral musicians from across the county, as part of English National Opera’s Orchestra Super 8 on Sunday 21 October 2012 in the MCC Cricket Academy at Lord’s, the home of cricket. Adrian Spillet, Section Leader Percussion for the CBSO said: “We’re hoping to raise both money and awareness for Leukaemia & Lymphoma Research and the Musicians Benevolent Fund. Both are important charities that strike a chord with people and musicians up and down the country. “The competition is tough. Not only are some musicians fine performers in their own right but we hear their also pretty good cricket players. We’re asking people to dig deep and support us in our quest to bring the Orchestra Super 8s title to the CBSO and to Birmingham”. The CBSO’s team of cricket enthusiasts includes the CBSO’s Associate Conductor and Captain Mike Seal, trumpeters Jon Quirk, Alan Thomas and Jon Holland, double bassist Julian Walters, violinists Byron Parish and Gabriel Dyker. They will bowl, bat and field their way through their competition with consists of teams made up of players from English National Opera Orchestra, BBC Concert Orchestra, BBC Symphony Orchestra, Bournemouth Symphony Orchestra, Freelance Players, Royal Philharmonic Orchestra and Session Musicians. Before the first ball has even been bowled, a bat, signed by the members of Sky Sports’ commentary team during England’s 2011 tour of India Mike Atherton, Michael Holding, Ian Botham, David Gower, David Lloyd and Shane Warne was sold at auction for £175. All proceeds will be divided equally between the two charities. All donations are welcome and can be made online by visiting the orchestra super 8 website at www.orchestrasuper8.com and clicking donate. All donations made through the website are split equally and go directly to the charities. You can also follow the team on twitter @orchestrasuper8 and like them on facebook.